I’ve never written a post before, but I thought with Christmas and Chanukah right around the corner, I would create a list of what I think are the best holiday gifts for dogs…and the people who take such great care of us! 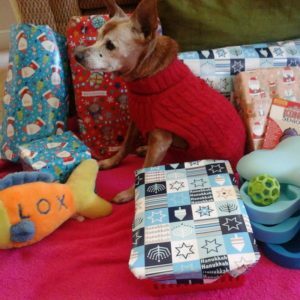 As a senior girl myself and someone who is looked after by the best dog mom ever, I decided I was the best “person” to put together a list of presents my fellow more experienced canines would appreciate. these gifts work just as well…and you get 8!! ONE IMPORTANT THING – you don’t need the holidays as a reason to buy something for your furry friend!! THE SECOND IMPORTANT THING – You may or may not know mom likes to help homeless, abused and abandoned animals, especially seniors like me. She helps rescue groups in Spain, fostered 4 animals last year while we were in Spain, and really wants to start a spay/neuter program there. All the money raised through purchases will go to helping her start that program. 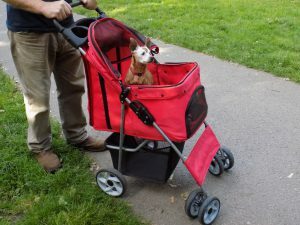 The single greatest invention and the one thing that gets a lot of use in our home is the pet stroller. It’s my folks favourite item because, to be honest, although they never left me behind they got tired of carrying me everywhere! Just because we’re getting on in years and may have issues, doesn’t mean we have to be stuck in the house. I’ve been traveling in style on trains and buses, and in the summer get to take lots of outings to the beach so my brother Jack could run around. We even borrowed one when we were in Spain for 4 months so we could all go travelling! Just so you know – they’re also fantastic for cats, puppies, kittens, and pets of any age recovering from surgery or illness. 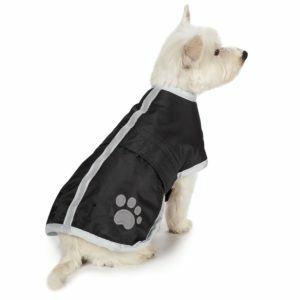 They come in so many styles, sizes and colours, you’re bound to find one to suit your dog – unless of course he’s a really big dog and then I think you might be out of luck…sorry! This is the one I use, how do I look? It’s a smooth ride on pavement, roomy enough for me and Jack when he needs a lift, easy to fold, easier to open, plenty of storage for a day’s outing and it won’t break the bank! Here’s a review mom wrote awhile back, so see what you think. 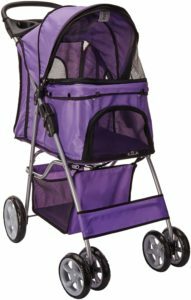 For those of you who like to jog (in this house that would be considered a 4 letter word), this jogger stroller is for you. Let’s look at some of the cool features. Second only to the pet stroller, my next favourite item is my bed. I do spend a lot of time in it, especially when the weather changes. I’m very particular about the type I use, and even when I use it. I have 3 different beds (although my half brother Jack confiscated one of them for his crate when he was recovering from spinal surgery and has yet to return it! ), so I have to make do with two. We’re all individual characters so what I like may not be what your dog likes, so you might have to cough up and buy a couple until your pup is satisfied. 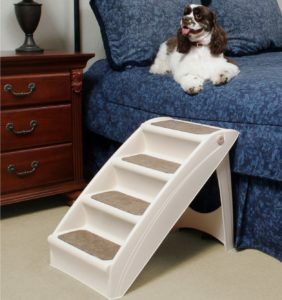 I’ll give you some friendly advice – if your dog has arthritis or mobility problems think about getting a bed that has a lower front and raised on 3 sides. The bolster gives your dog something to lean against, and the lower opening means he doesn’t have to lift his leg too high to get in. I also like having a fleece blanket on all my beds to add another layer of padding or softness if I’m in the mood, but even more important it’s to wrap myself up in just in case I’m feeling a chill. 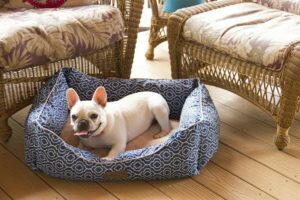 For dogs that prefer a flatter “mattress” style bed, here’s one to consider. I like that it has memory foam and a support foam for added comfort for achy joints. The removable cover is 100% waterproof and machine washable, so in the case of an accident the foam is protected. It’s also hypoallergenic and resistant to dust mites. Once again because I’m a fan of the blanket, leaving one on this bed can give your dog something to rest his head on if he wants. I have my eye on this one for several reasons. I am a big fan of this style bed, and although I don’t have this exact one, I do have something similar. The fact that it’s lower in the front means it’s easier for me to get in and out of. I have very tiny legs, so I prefer not having to step too high, and for my friends with arthritis or stiff joints, it can be difficult for them to lift their legs too high, so perfect for them as well. The three sides means I can rest my head as I like to do sometimes, and the nice selection of colours will go with any colour scheme, including my own fur. An added bonus is how easy it is to clean, simply toss the whole thing into the machine, then the dryer, and voila. We all have our preferences when it comes to pillow thickness, so in our house there is a blanket on every bed so we can adjust the comfort level, or just wrap ourselves in it. I like the flexibility either way. I love food! I may be blind but my hearing is exceptional. So exceptional in fact, I can hear a bread crumb fall. Due to some health issues, I can’t eat the wide variety of foods I used to, but I get by. A few months ago my human realised it would probably be a good idea to elevate my food bowl, so I could eat more comfortably. She had already done it with my water bowl, and I must admit it’s made drinking a lot easier. There are some ordinary looking bowls, and some fancier ones if you prefer. Some also adjust to suit various size dogs, which I think is a very considerate feature. Not all canines are petite like I am. I’m a fan of wrought iron, and my favourite colour is black, so when I saw this I had to include it. Notice the cute bone design? Use it as a water bowl, food bowl or buy two. 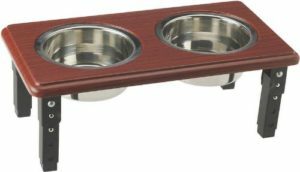 This elevated feeder comes with 2 bowls, 1 for food and 1 for water or 1 for dry food and 1 for wet. That’s up to you and your dog. I love that it’s adjustable, the combination of wood and metal is very attractive, and for the more enthusiastic eaters, the non-skid feet keep the feeder from sliding across the floor. You humans will love the fact that it comes with 2 dishwasher safe stainless steel bowls. I don’t like seeing dogs in dresses and the like, because we’re dogs not your children. But…when it’s for protection against cold and the elements I can’t live without them. While it’s true I do have some very nice hand crocheted coats courtesy of my mama, a large part of the year I have to wear a sweater indoors and out to keep me warm. No offense, but the woman who cares for me isn’t that talented, so we have to rely on store bought sweaters. Although having said that she recently started learning how to knit and she’s on her third one for herself. Perhaps I can be next? Given the fact I’m a red head this colour doesn’t suit me, but it may suit your furry companion. I’ve included it because I do like this style sweater, and it’s the one I like to wear, although I’m a cable knit type of girl. It’s 100% acrylic which is perfect because wool makes me itchy. It comes it different sizes, 6 different styles, is machine washable and suitable for the dryer. We wash my sweaters in the machine all the time, and I’ve never had a problem with them not fitting or falling apart. Love, love, love this coat! It comes in 8 sizes and 8 colours, it’s water resistant and reversible. The inside is fleece so it’s warm and comfortable, and the reflective stripe means I light up at night. There’s a cute paw print design on the back, for a bit of fun. I’m quite fussy about the closures on coats, and these adjustable Velcro straps under the neck and stomach are my preferred style. I don’t know why I find this the most comfortable, but I do. I’m afraid I have dementia. Not a very severe case, but I was getting riled up at one point, especially before I was put on medication. The only thing that helped relax me was classical music. The story behind how the CD came to be is too much for me to write about, I’m afraid you’ll have to do some research on your own. All I can tell you is that it works and it’s Red approved. It’s also great for dogs that suffer from separation anxiety, and panic when they hear loud noises like thunder and fireworks (which should be banned BTW – the fireworks not thunder!). If you have cats (I love cats you know), there is music especially for them. I’ve noticed my human mom dosing while listening. Okay I didn’t “notice” because I can’t see, let’s just say I heard her snoring. Don’t ask her if she snores, it’s a touchy subject, and she’ll deny it anyway. Just like electric blankets for humans, there are electric heating mats for us, but to be honest, I prefer to not go the electric route. I found this, and liked it…a lot. All you do is heat it up in the microwave, put it underneath your pet’s bed, and it will stay warm for up to 10 hours. We have the heat on, and there’s a blanket if I need it, so this added bit of warmth is perfect. Another electric-less option is the self warming crate pad. Okay I’m not in a crate, but just because it says it’s for a crate doesn’t mean I can’t put it to use in another way. It radiates my body heat back to me so it keeps me warm, just put it under the bed or blanket, and it does the trick. It’s machine washable and available in 3 colours. I have made it impossible for anyone to brush my teeth. I mean it! My human is no pushover, but when I clamp my tiny jaws shut nothing’s opening them. That’s why I’ve had dental surgery…three times. I’m blind, I don’t know what she’s trying to do to me! For those with more easy going natures, a toothbrush and a toothpaste are great gifts. Clean teeth will keep you healthier longer, something your humans will be grateful for. 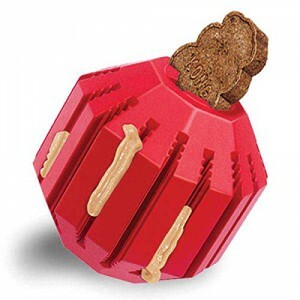 It’s not the most glamorous gift you can give, but create a themed gift by adding a chew toy and dental chews. Believe me, your dog will love it. PSSST – here’s a little tip. If your dog refuses to allow any sort of brush near his mouth, try wrapping some gauze around your finger and brushing that way. Even a little bit is better than nothing. The long handle keeps your fingers safely away from sharp teeth, and the 2 sized brushes with super soft bristles should fit any size mouth. It’s a best seller so that’s a good sign. A finger brush is the perfect alternative to the “traditional” long handled toothbrush. It fits over your finger, and your dog won’t see this long stick thing coming straight at him. It also will give you more control so you can reach every part of his/her mouth, and get it done quickly. They’re disposable so no need to wash the brush each time – nice and simple! The perfect alternative to using a toothbrush and toothpaste! These moistened pads are made in the U.S.A., cruelty free and are biodegradable. They have no sulfates, parabens, artificial colours or detergent. They contain all natural ingredients (which I prefer!!) like Organic Aloe Vera Leaf Juice, Witch Hazel, Grape Seed Extract, Rosemary, Peppermint Leaf Extract and Green Tea (to name just a few). Continuing on with our natural dental care products, this line is perfect for those of you who don’t want chemicals fed to them (as I don’t), and you’re fussy (as I am). A bit of gel or spray in the mouth and it helps tackle dental problems. That doesn’t mean you don’t need to get your dog’s teeth checked on a regular basis – you do, so they do, but it will help. 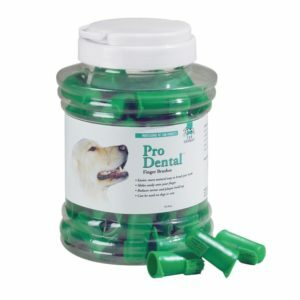 Made in the U.S.A., this all natural pet dental product will help with your dog’s decay, plaque and tartar problems. 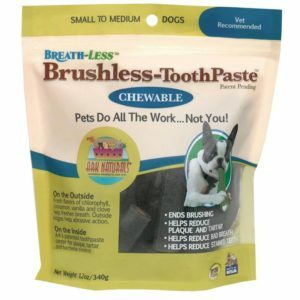 The outside helps with stinky breath, the inside core includes toothpaste and other ingredients that help support dental health. No wheat, corn, soy or animal protein which is great. They come in mini, small/medium and medium/large. Check it out for a full list of ingredients and benefits. There are always treats in our house, and the keyword here is variety. They also have to be grain and wheat free, natural and with ingredients we can pronounce. I can’t have any unless they’re vegetable based and I don’t like that kind so I won’t eat them, but my half brother Jack isn’t limited in that way. Don’t forget to check ingredients with your vet first if your pup has health issues. 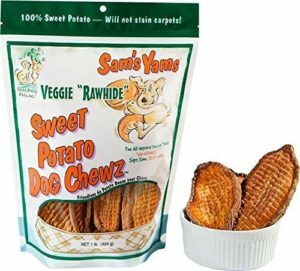 If you’re sick of meat, or have to limit it or omit it from your diet, these sweet potato chews are perfect. Made only from human food sweet potatoes, they are nutritious and excellent for teeth and overall health. The company uses a special drying process that transforms the sweet potato into a chew similar to the consistency of jerky. Available in 3 different sizes, I think they’re fab. Another all natural “made in the U.S.A.” product for my 4-legged amigos and amigas. 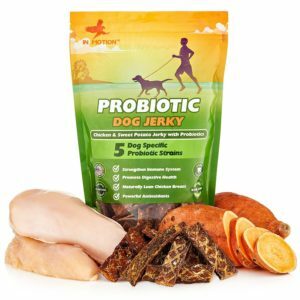 These Chicken Jerky treats contain the health benefits of probiotics with non GMO sweet potato and USDA chicken breast. 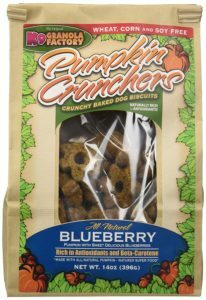 If you prefer biscuits for the crunch, then these Granola Pumpkin Crunchers may be what you’re looking for. My goodness the U.S.A. certainly makes a lot of tasty snacks for us don’t they! The first ingredient is pumpkin so you’ve got my attention, and they come in different flavours which is great because I love variety – blueberry, sweet potato with carrot and parsley, apple & cranberry, peanut butter and banana. Who doesn’t love a toy, and with so many different types, how can I choose? Luckily I don’t have to, because we always have a variety to suit every mood, and activity level. 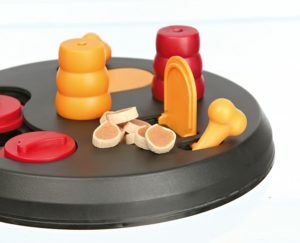 We love treat dispensing toys…because we love food! I may be blind but my nose works perfectly fine thank you very much! 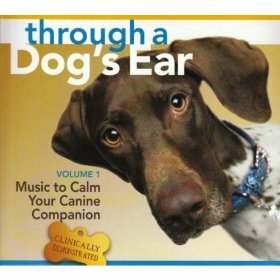 This is called mental stimulation and it’s so important for dogs of all ages. Of course we need our walks and runs, but sometimes our parents forget our brains need exercise as well! Level of difficulty can be increased to give us an even bigger challenge. 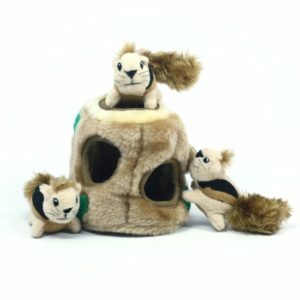 This hide and seek toy is crazy popular, with over 9,000 pet parents writing some great reviews. The squirrels are squeaky, which of course many dogs love noisy toys, and just stuff them into the plush tree and watch your dog drag them out. Keep it going by re-stuffing them each time. Any size dog will have a blast – The Junior, Large and Jumbo sizes include 3 squirrels and the Ginormous size includes 6. Rather than limit myself to showing you just one style, I’ve included a lot! I love a Kong, and it’s the one thing that can actually keep me busy. Cookies and chews I finish in no time, but a filled Kong, especially if it’s been in the freezer for a bit can keep me busy for a long time. Good luck picking just one! Seeing that it’s Christmas and Chanukah, why limit yourself? 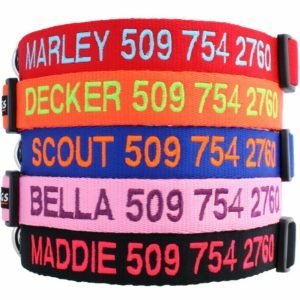 When I’m out and about I can’t help but notice how many of my 4-legged relatives don’t have collars and ID tags. I must say I find that very disturbing. When if he or she got out and needed help finding his way home? Other important accessories include harnesses and leashes and I do have a selection because Mom gets bored of seeing the same one on me. Okay I admit it, I like to look fashionable when I’m out and about. 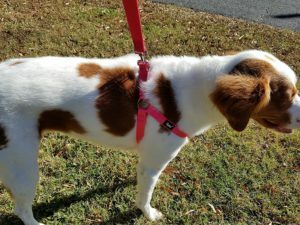 Remember me mentioning collarless and ID tag-less dogs? Well this is perfect as it’s 2-in-1. The nylon is strong, the D ring is stainless steel, and the buckle is easy enough to open one handed. If your mom likes to match your collar to your sweater, I know don’t tell me, there are 5 colours to choose from. As if that wasn’t great enough there are 15 colours of thread!! It comes in 4 sizes (XS, S, M, L) so hopefully there’s a size to fit you. I’m all about safety, and now that it gets dark so early you’re going to have to be seen, and this collar is perfect. As a matter of fact my neighbour has one and even though he’s dark brown, I can see him coming for a mile. Actually I’m blind so I can’t “see” him but you know what I mean! 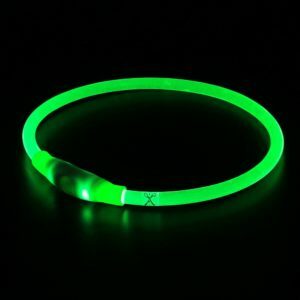 Anyway, this is the neon green one, but there are other colours as well – ruby red, royal blue and cotton candy pink. The collar is 70cm, but can be cut to any length using just a regular pair of scissors. It has 3 settings – slow flash, quick flash and a steady glow which you choose at the touch of a button. It’s also rechargeable so you don’t throw it away when it stops working. Slip it over your pups neck to wear it with his usual collar. Love the collar, love the colour selection and I love the reflective threads sewn into the pattern. Want to hear another fab thing? It comes with a matching leash and harness!! 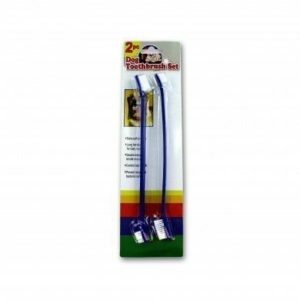 Aside from being the ideal size (we like 5 foot leashes the best! ), we also like that it’s made from recycled water bottles. Why throw them into landfills when they can be put to such excellent use. 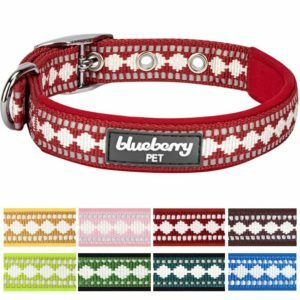 An adorable dog design, beautiful colours and a padded handle make this a great buy. Oh, did I mention there’s a matching harness sold separately? This is the favoured style of harness in this house. I don’t need one but Jack does. Sadly he wasn’t treated very nicely in his previous home, so when we first adopted him home he wasn’t very friendly to man or beast. In order to keep him safe he wore a harness so in case he freaked out he couldn’t get away from his mistress. He’s a zillion times better now but he can’t entirely forget his past so with the attitude of “better safe than sorry” he wears a step in/step through harness. Again because of his past he doesn’t like when things take too long, he gets annoyed so this style of harness is the quickest to put on. Put it flat on the floor, put your dog’s feet in the spaces, and snap it shut. 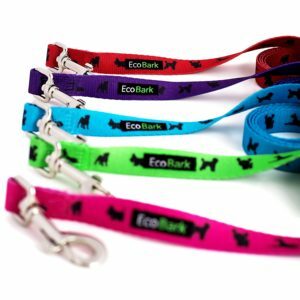 Six colours, 3 sizes, adjustable and a sturdy D ring to attach the leash to, it works well for us. Okay I know they aren’t fun presents like a new toy or type of treat, but some of us have mobility issues and some extra help would be greatly appreciated. That doesn’t mean you still can’t throw in some toys does it? Some of us are too little to ever have been able to get into a car on our own, some of us are having a harder time doing it nowadays. If you have a smaller dog you can lift him in and out of the car yourself, but what if you have a bigger dog? Or you’re having some mobility issues of your own? 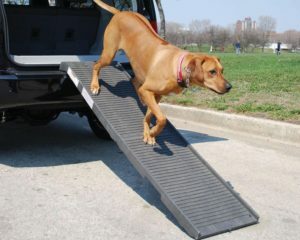 A ramp will protect your back and joints, and give your dog back some of his independence! The non-slip surface means plenty of traction even in wet weather, it folds in half for easy storage, ergonomic handles means easier to carry and it holds up 500lbs (animals only please!!). I can imagine your head must be spinning, I know mine is just from writing all this. Okay, we’ve gotten to the end of the gifts for your doggies, but what about something special for yourself? After all, we wouldn’t be here if you didn’t take such great care of us and I’m definitely speaking from experience. You make so many sacrifices for us, and I know how stressed many of you get worrying about our health issues, so you deserve something nice as well. You can certainly buy it for yourself but better yet, leave this in a handy place for others to see – as a hint! I’m going with the dog theme because, well… I’m a dog! Have you seen the new(ish) trend for adult colouring books? They’re supposed to teach you mindfulness, and help with stress release. My mom has one her niece bought her, and she loves it. It’s a challenge for her to keep her mind off her website for a whole 10 minutes, but bless her, she does her best. Because I’m a dog I’m going to recommend the dog one. If you’ve been feeling a little guilty lately wondering if it’s okay to be drinking alone, now you don’t have to worry. This adorable stemless wine glass (a style I’m starting to be okay with) says it all. 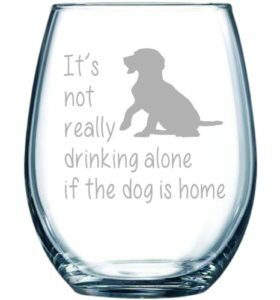 If your dog is home then you’re not drinking alone. This limited edition 22 Agate bead memorial bracelet is not only beautiful, its’ sale also provides 22 meals for shelter animals. Having come from a shelter myself I fully support that idea! It’s impossible for me to wrap my head around the fact 2018 is just around the corner. It’s about this time when my favourite human starts shopping for her new calendar. I saw this one and thought it was cute – perfect for your office desk I would say. 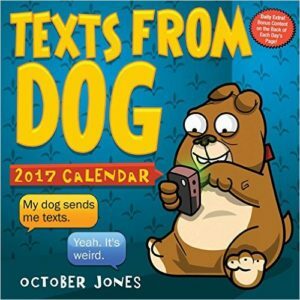 Based on the popular textfromdog.tumblr.com, each page features a hilarious, and occasionally rude SMS exchange between Dog, the foul-mouthed British bulldog, and his owner, October Jones. This is a seriously sweet gift, and who wouldn’t love it? Keepsake boxes have so many uses – from storing buttons and change, to a precious piece of jewellery or a child’s lock of hair. Every time I thought we reached the end of this list, she found something else to add. I finally had to put my paw done and say “enough.” I worked really hard on this guide, but I needed to make sure you would buy your furry companions something they’re going to love. I feel like I owe them! If you’d like to send us some pictures of your dog opening presents, I’d love to see them. 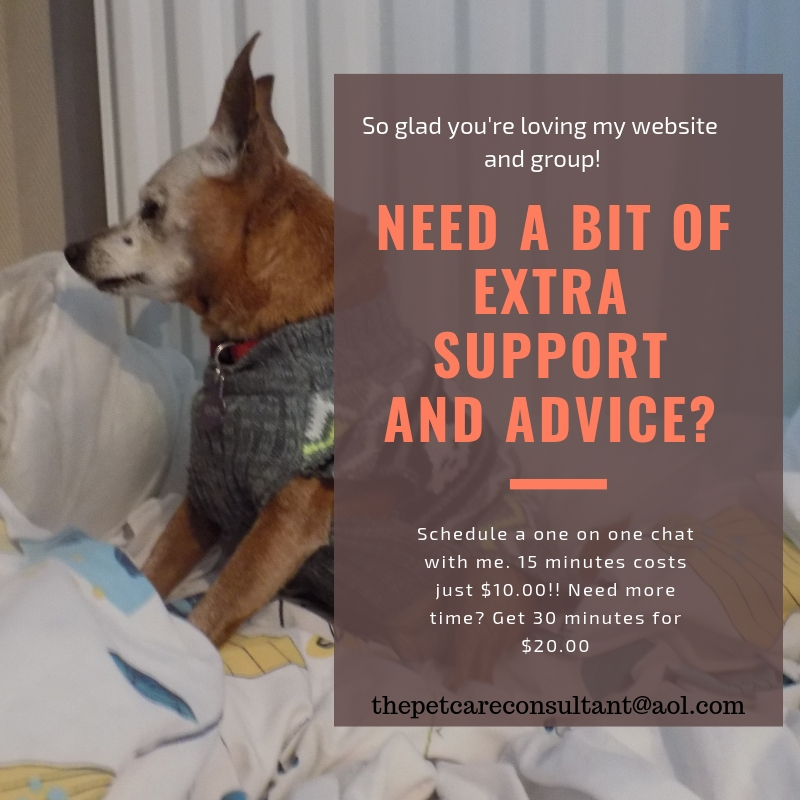 Add them to my Caring For a Senior Dog FB page or if you share your life with a senior, please accept my invitation to join Senior Dog Care Club, and post them there. 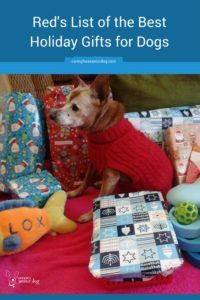 Hindy, these are all fabulous ideas for senior dogs! I love that you included all these great dental products. 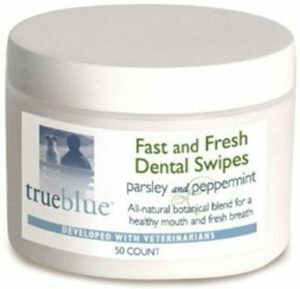 I use the True Blue wipes for Phoebe’s eye tear stains, but didn’t know they made tooth wipes – I need to get those! 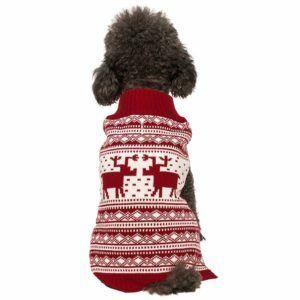 I’m wild about that gorgeous red holiday sweater – it’s too cute! Great job on this list. Thanks Cathy. Wipes are such a great idea, and an alternative for dogs who aren’t wild when you come at them with a toothbrush! Great list! I actually just purchased two of those very same beds last month and have a third on the way for the FiveSibes outdoor winter deck bed! They are really nice! 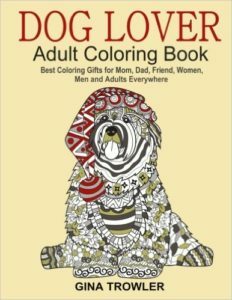 Love the adult coloring book…great for those stress days when you want to just “blank” it all out – or…are brainstorming for writing and need to “clear the mechanism” for awhile! So many great things here…Pinning over on my “Ho-Ho-HOWLiday Pet Gift List” board! I’m so glad I’m featuring a bed that you’re loving!! My niece bought me a mindfulness colouring book, and it is a great way to clear your mind for a few minutes. Love, love, love the name of your board. Great job on your first post, Red! It seems like Christmas shopping starts earlier and earlier each year, so I don’t think your list is too early. You’ve gathered a great list of ideas. I think my senior pup Eddie would love the Hide-A-Squirrel toy. Red says thanks!! That Hide-A-Squirrel is so popular it’s unbelievable, dogs seem to go crazy over it. When I saw Christmas cards in August I flipped. 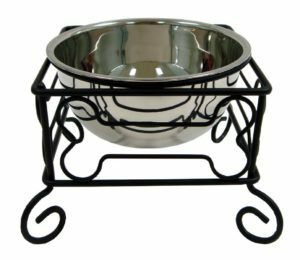 Those food and water dishes that are raised on the stands are essential for all pets but especially cats and smaller dogs! I want a doggie stroller for our Lyla this year too. Thank you Joely. Red knows what dogs like! We use many of these items right now – and we don’t have seniors – because they are too, too great! 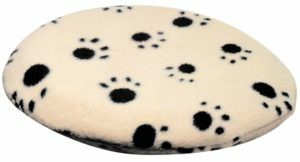 We particularly love the little round warmer disc – this is great for our pups when we travel crossed the wintery, snow covered mountain passes in WA state. Just a little microwave, stick it in their booster seats under a blanket, and wham – they love the little warm disc and snuggle up and go to sleep! Thanks for sharing these! So glad to hear that Rebecca. I love that everything on Red’s list is perfect for dogs of all ages. She’s thoughtful like that! Red is very proud of herself! If you have a picture of that send it over, how adorable. Great job Red! You did an excellent job! So many wonderful ideas in this post – we have taken notes. I’m definitely going to look out for those dental wipes. We have a warming bed for Ruby though the kitties seem to enjoy it more than she does. Another great idea (though it is a summer item) is a cooling vest for older dogs. Thanks for all these great ideas! P.S. : Love the reindeer sweater! I will pass that on, she is rather pleased with herself, being her first attempt and all! Those cooling vests are amazing, I probably should have added that I guess I’m thinking winter. My neighbour bought one for her older German Shepherd who was really suffering in the heat this summer. The second she put it on her dog she felt better. What a great list, seems like an old pro. 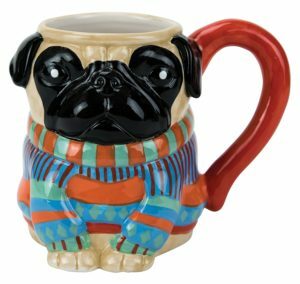 I think Kilo the Pug would approve of most things. Of course, as a hungry young Pug who never gets fed, the treats would be his favorites and I love the treat toys/games. He is not a fan of clothes but doesn’t mind his similar Christmas Sweater. Some good products for teeth. Thanks! What a coincidence, Red never gets fed either so of course would want the treats!! Old is a state of mind, just like with humans. Thanks Malaika. Dogs of any age can still learn tricks, and we know how great mental stimulation is. What I love about some of the puzzle games and a Kong is that Red, who is blind, can use them. Red, these are fabulous tips for dog owners. You are so lucky to be so well loved and taken care of. Thanks Lola, I think we’re all lucky! This looks like a very thought out list! I think my dogs and cat would really appreciate the self-warming pads. Thank you. Red was very careful about which gifts she recommended. The self warming pad had to be on the list because she does not like being cold. Wow what a great list. Thanks Kimberly. If you’d like to send in a picture of your dog opening gifts, I’m happy to post it. I love the heating pad and the jumper. Totally awesome! We have that exact same pad for Dusty 915) and he loves it. Not the cheapest BUT one of the best! Well done with some wise gifts for the senior pups! Thanks Dash!! Being blind I’m careful about cords and things, so any warming pad has to be cordless with no strings attached…literally! Red wears a sweater several months of the year, so naturally she’d have to add that for her fellow pups! Thank you Robin. Red worked very hard on that list. As a fan of sweaters and coats, she had to include a couple, and although she would have no idea what to do with that toy, she knew how popular it was so wanted to give every pup a chance to have one. How fun for our senior dogs. These are really nice ideas and gifts for a senior dog. I love keeping a dog’s mind engaged. So many times pet parents find themselves NOT training or playing with their seniors. I’m glad you are helping to promote good activity. Thanks Tonya. If I even mention the words “mental stimulation” people look at me like I’ve just landed from another planet, yet I persevere. What a great collection of items! You did a great job writing a post like this. I look forward to researching some of these items further to purchase for friends with pets in preparation for the upcoming holiday season. Thanks so much for putting this together! Thank you Bryn. Red put a lot of effort into making sure she highlighted a wide variety of items, to suit all needs and varied tastes. Great list of items. My mom’s dog loves his orthopedic doggy bed. Thanks and glad to hear that. Comfort is key! Oh my gosh, that sweater! Mauja and Atka would absolutely hate me if I tried to put them in a sweater (they’d be way too hot), but I love it so much! Thanks, glad you like it. Unfortunately it’s not “too hot” for a sweater often enough where we are. You know I have a special place in my heart for senior dogs! So I love this guide and just tweeted it. 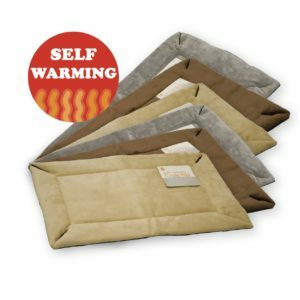 I love the heating pads and these are great for dogs with joint and hip issues. I use this for my old dog at night and just make sure there are blankets underneath so they’re not touching his skin/coat. Love this! Thanks Christy! Heating pads are wonderful, nothing worse then seeing your dog shiver. Poor Mr. N – I think he’ll appreciate one. What a great post! I love the idea of heating pads for senior pups! Here in Minnesota it gets so cold and is hard on the joints! This would be perfect for my pal Abbey!!! Thanks very much. Heating pads are great for helping the dogs through the winter. We’re in England, I’m from Canada and Red is from Florida. I find it freezing here because it’s a damp cold, imagine poor little Red. Coats, sweaters and heating pads – a winning combo for everyone!! Nice comprehensive list. Love the heating pad ideas. I used to warm blankets, etc. in the dryer and wrap my super senior pup for extra warmth. I have the Willow Tree Keepsake box. I keep my dogs’ found dog whiskers inside <3. That’s a good idea to warm the blankets in the dryer, I throw them over the radiator!